✅ PREMIUM: Our Best Grooming Brush and Comb that Removes Fur and Hair Quickly and Safely. Designed by Dog Owners for Small, Medium, and Large Pets. Great for Dogs and Cats. ✅ ORGANIC WOOD HANDLE: Why? We understand the world has enough Plastic. Our Solid Wood Grip is the Most Comfortable and it Provides Feedback During De Shedding and Grooming. Deshedding is Now Safer as you Groom your Pet. The Wood Handle Provides Feedback as you Comb Your Pet. You Feel every Contour on your Pet - not like Cheap Plastic. ✅ STAINLESS COMB: We Listened! We Perfected the Best Comb. Super Easy to Clean Fur from Teeth. Our Tested Tooth Length, Comb Spacing, and Rounded the Fine Tips make Grooming Fast and Safe. Our 4 inch Wide Comb is the Best Width for Large Areas and yet gets into Crevasses. Great for Frenchies, Bulldogs, Labs, German Shepards, Poodles, Retrievers, Huskey, and Cats. Our Best Dag Tool. ✅ RECOMMENDED: Veterinarians, Groomers, and Pet Professionals. Effectively reduces shedding on Short, Medium and Long Hair. Removes even the Undercoat Hair. Wood Handle and Long Teeth Allows Deep Fur Removal and Stimulate the Skin Blood Circulation. Dogs and Cats Dig it. ✅ SATISFACTION: We are an American Based Company and we understand you have Choices. Therefore, Quality and Effectiveness are important to us. Our Handle is even easy to hold for arthritic and sore hands. By iPrimio REGISTERED BRAND on Amazon and a Michigan based company. 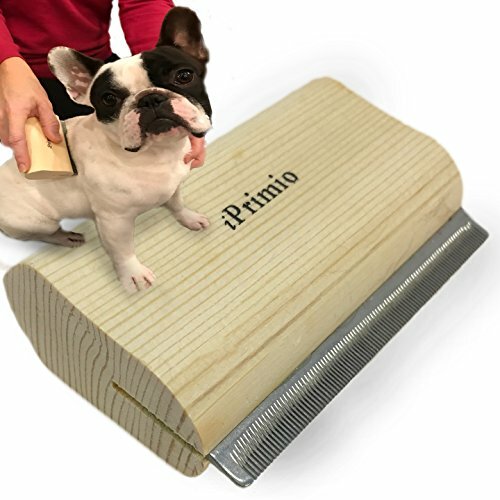 DESIGNED BY PET OWNERS FOR DOGS, CATS AND HORSES - Grooming is great for building a bond between you and your pet, so make it easy with IPrimio Pet Grooming Brush and Comb that removes fur and hair quickly and safely. Our Tested Tooth Length, Comb Spacing, and Rounded the Fine Tips make Grooming Fast and Safe. NO MORE BREAKABLE PLASTIC COMB, ITS ORGANIC WOOD - Our solid wood handle helps in gripping the most comfortable way and it provides feedback during deshedding and grooming that makes it safer unlike with cheap plastic. The Wood Handle Provides Feedback as you Comb Your Pet. STAINLESS COMB THAT REMOVES TANGLES GENTLY AND STIMULATE SKIN - We Heard You! Its 4-Inch-wide comb is the best width for large areas and yet gets into Crevasses. Perfected by making it super easy and gentle to clean fur from teeth. Long teeth allow deep fur removal, stimulate skin and fluff. RECOMMENDED FOR PET OWNERS, VETERINARIANS, GROOMERS, AND PET PROFESSIONALS - Choosing the right brush for your pet is an important first step for even the most basic home grooming. Our brush Effectively reduces shedding on Short, Medium and Long Hair. It removes even the undercoat hair.